The global Sustainable Development Goals – or SDGs for short – apply equally to all nations. They are linked with and depend on one another: policies aimed at implementing one goal also affect efforts towards all other goals. Achieving this holistic perspective requires more network creation, more communication, more partnerships and more coordination between the political arena and society. 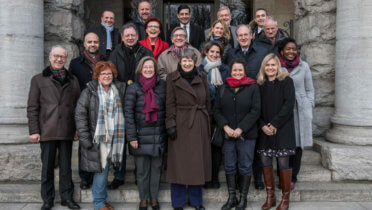 The Council outlined for the Federal Government what this entails for Germany in its opinion paper of May 2015: the 2030 Agenda cannot simply be implemented in Germany; Germany also has to make a contribution to worldwide efforts through German engagement and cooperation with other nations. The Federal Government views the German Sustainable Development Strategy as a guide for implementing the 2030 Agenda. In 2016 the national sustainability strategy was fundamentally revised and restructured so as to fully incorporate the 17 SDGs. As a result, relatively new topics have moved into the focus. In many cases, suitable political instruments will first have to be developed, such as for reducing food waste in Germany. The strategy has been structured to be incremental and process-oriented, so it can be continually revised and improved. 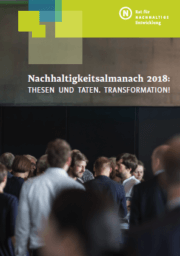 The German Council for Sustainable Development is involved in this ongoing process of development too and communicates new ideas and suggestions to the Federal Government as well as to the wider public. In addition, at the request of the Federal Government, the Council has facilitated a third international peer review. 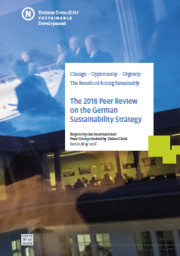 Through mid 2018, a group of international experts reviewed the German Sustainable Development Strategy and its implementation and subsequently presented its recommendations to the Federal Government. The two previous peer reviews were carried out in 2009 and 2013. Other projects of the Council show as well how sustainability policy is becoming more and more international. 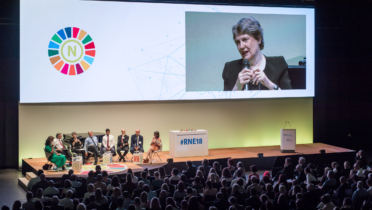 In November 2016 the RNE initiated for the first time the Open SDGclub.Berlin, which comprised some 90 participants from over 30 countries. The participants came from national or sub-national sustainability councils or similar bodies, from regional, national or international civil networks, from the business sector and from municipal authorities. Through this initiative, project participants were able to share with one another their experiences related to implementation of the 2030 Agenda. 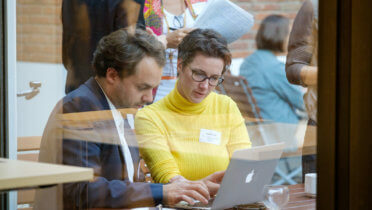 This resulted in new partnerships between civil actors at a variety of levels. 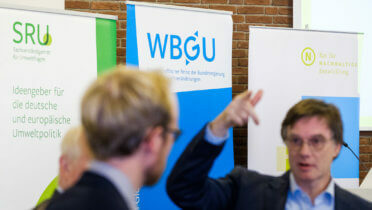 Via the Open SDGclub.Berlin, the Council also links civil initiatives and representatives of civil society in person with decision-makers at the level of the United Nations, such as from the High-level Political Forum. 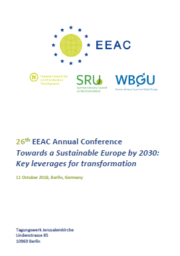 This invigorates mutual learning at institutional level, which is something the Network of European Environment and Sustainable Development Advisory Councils has been pursuing for some time. The European Sustainable Development Week shows how sustainability is being implemented throughout society. The Council supports the project. 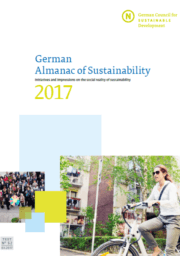 The Council responds to international interest in Germany’s sustainability activities through its publication of the German Almanac of Sustainability, which presents “Sustainability made in Germany” for interested parties from all over the world. Günther Bachmann - Stakeholder-policymaker cooperation in the age of the SDGs: what new approaches are required for success?